I his small, ground-dwelling bird of dry, open grassland has a compact body, strong legs and feet, staring eyes, and a slender bill. 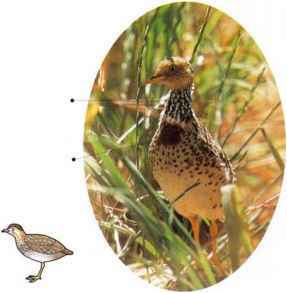 In all these respects, it is similar to the .Small Button-Quail. However, it prefers more open habitats, moving cautiously and only occasionally standing on"
tiptoe to peer over the grass. It may be seen in fluttering, dipping flight, or perching on a fence post or mound. The diet consists of seeds and insects. The female is more brightly colored than the male and is the dominant partner. She may mate with several males, which act as the main carers for the eggs and young. 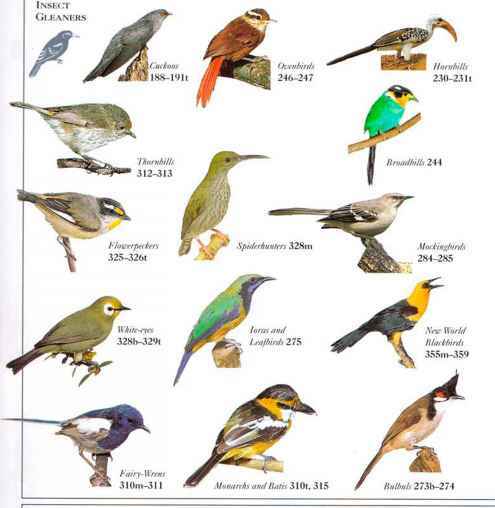 • NEST A shallow hollow in the ground, lined with grass, and situated alongside a tussock or small shrub. • Distribution interior of S.E. Australia. 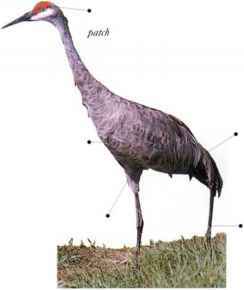 I his small crane is mostly gray, apart from its red crown and white cheek. Some individuals arc stained reddish with iron salts that are present in the water and are transferred to the plumage when the bird preens itself with a wet bill. A bird of open, marshy landscapes and grassland, the Sandhill Crane breeds in scattered pairs, but gathers in large and often noisy flocks for migration. It feeds on seeds including grain, and on buds, shoots, leaves, and small animals from insects to mice. • Nest A heap of plant material, large if on a wet site, with a central hollow.